Modi'in, Israel – “Redeployment of Israel's Northern Border: The Civil War in Syria” was the topic of the latest Jerusalem Peace and Security Forum. Colonel Moshe Zurich (Reserve), a former Israeli military attaché to the United States and the former deputy head of research at the Directorate of Israeli Military Intelligence, was the first speaker at the Dec. 25, 2014 forum at Modi’in’s Multicultural Center. The situation regarding the war in Syria is unstable and unpredictable, he said, with obvious implications for Israel's security. Israel's northern border in the past included two neighboring countries: Lebanon and Syria. However, according to Col. Zurich, the border is now “continuous” and inhabited by various ethnic groups. The “other side” of Israel’s northern border is controlled by terrorist organizations of radical Islamists, including the group calling itself the Islamic State. As such, Israel’s latest challenge is to defend itself not from an army from a hostile country but from terrorist groups. Col. Zurich said he believes that the Israel Defense Forces have adapted to this new tactical dilemma and are fully prepared to protect Israel's citizens. Mr. Pinhas Inbari, a veteran Arab affairs correspondent and analyst for the Jerusalem Center for Public Affairs, offered his perspective on the various challenges faced by Israel from the Syrian dilemma. 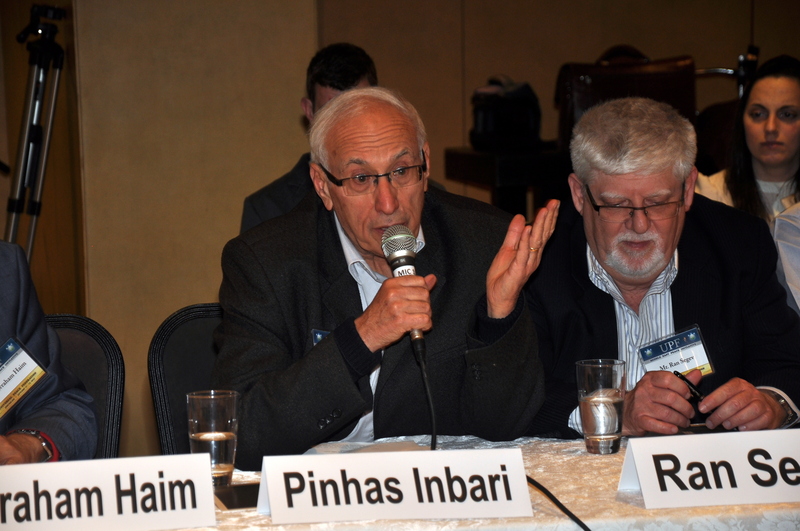 The developments in Syria can open up new opportunities, Mr. Inbari said, depending on how Israel uses them. He suggested that the notion of “state,” as it is commonly understood, is fading away, with “communities” filling the vacuum. When such communities gain legitimate recognition, so will Israel—which is actually a “Jewish community” in the broader sense. The problem, Mr. Inbari said, is that the movement from states to communities is not the only challenge to dismantling the old regimes; there are also the Pan-Islamist radicals who very much would like to launch a Muslim caliphate from Syria and Iraq. The old Baathist regime under former Syrian President Hafez al-Assad did not accept the notion of “state” either and defined Syria as a “district”—one of many in a hoped-for Arab empire. The caliphate follows a similar notion but focuses instead on Islamist precepts. In both cases, neither Israel nor other communities, such as the Kurds, the Druze or the Alawites, can coexist peacefully in such an environment. Christians and Alawites were able to exist under Pan-Arabism but not under Pan-Islamism, so only if communities allow themselves to be defined by Pan-Islamist notions can they be permitted to exist legitimately. As long as Pan-Arabism or Pan-Islamism prevails in the Middle East, Israel and other communities won’t be accepted as legitimate members of the region; but once other communities will be recognized, so will Israel. The participants also included Mr. Daniel Sherman, an international relations analyst, and Dr. Arie Geronik of the Department of Political Science, Open University of Israel. קודם רשומה קודמת: שלמה גנור: הבלוג על חיזבאללה ראוי לשבח! הבא רשומה הבאה: בלוג JCPA: לחיזבאללה גם בעיות בעדה השיעית. שיח' סובחי טופיילי.